Bees are essential to our eco-systems and our crops, and we know that their numbers are rapidly declining. There are several reasons for this, excessive use of pesticides and the dwindling of bees' natural habitats among them. The good news is that there are things every gardener can do to help save the bees by making their garden more wildlife-friendly. From the simplest steps such as planting bee-friendly plants to beekeeping in your garden, we cover all the main ways you can help the bees by creating a bee friendly garden. Get more comprehensive advice on how to create a wildlife garden in our guide. Native flowering species, such as thistle, heather, hardy geranium, hawthorn: this is where native plant knowledge really comes in useful; non-native species that look beautiful in our gardens, such as South African pelargoniums, don't produce the nectar bees need to survive. If you are unsure about which flowering species are native, simply go for a 'wildflower mix' seed pack and sprinkle it over your borders. The good news is that a lot of these plants are classic gardeners' choices anyway, so you don't necessarily have to plan a bee-friendly planting scheme in order to have some of them in your garden. In fact, you can even relax your weeding regimen a bit, since bees love dandelion nectar, and it's an important source of food in spring, when there are not that many flowers about yet. 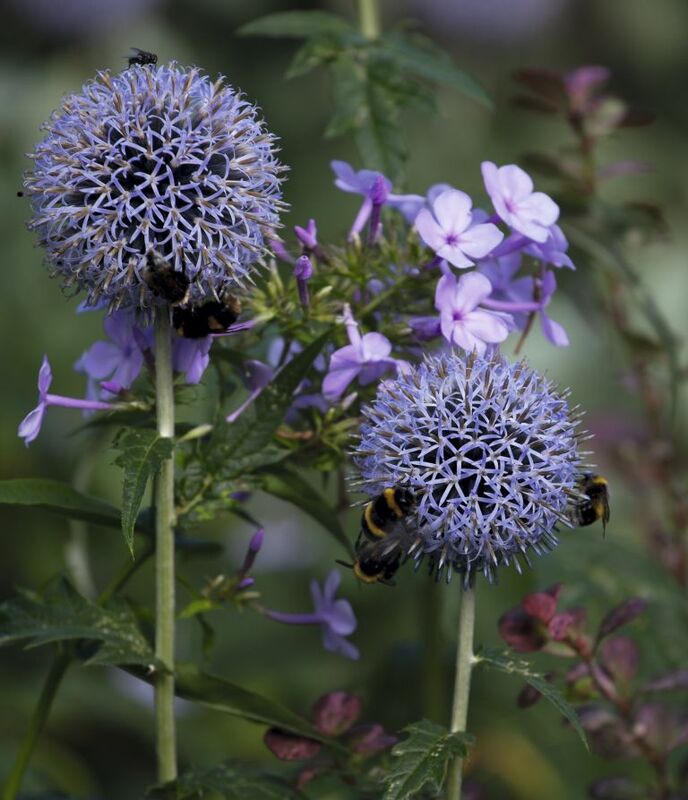 Bees' preference for purple is a bonus, too, since it's one of the most popular colour choices for planting schemes. Soap: this is the simplest natural pesticide solution, but be sure to use only natural, plant-based soap that does not contain any bleach. Grate half a bar of soap into your water spray bottle; shake well, then spray over leaves and stems. A word of caution: just because a pesticide solution is natural, it doesn't mean that it's completely harmless or isn't strong. Be very careful not to spray anywhere around the flowers that bees pollinate, and be aware that anything you spray on your plants will kill beneficial bugs as well as harmful ones, so always consider whether you need to use any pesticide at all. Strong, healthy plants that are watered regularly and get enough sun should be able to cope with small numbers of pests without the need for any intervention. Because of the scarcity of food, many bees now travel much further than they used to, and some of them get too tired to travel straight back. Provide foraging bees with a welcome stopover by installing a bee house in your garden. From simple bricks with holes drilled through them to elaborate and decorative pieces, there are lots of options to choose from. Not many people know this, but bees do need access to water, so consider installing a small water basin or even just leaving out a bowl full of water for them. Do bear in mind that bees can drown, however, so leave a cork or some pebbles in for them as islands. Where it comes to honey, verifying its organic status can be tricky. Bees forage for many miles for food, so will inevitably feed on plants that have not been grown organically. However, when buying honey, try to be aware of the reputation of the producer: do they let their bees forage freely and encourage natural behaviours such as swarming? Do they leave some honey for the bees, allowing the colony to recover? It is very easy to do a search on a producer before purchasing honey from them, and most honey producers who label themselves 'organic' or 'natural' will be forthcoming with the information about their beekeeping practices. If you have a large garden, you may be able to support a small bee colony yourself. You can do this even in an urban garden, as there is no law that forbids it (although it's probably a good idea to notify your neighbours). You will need to familiarise yourself with beekeeping legislation to ensure your beekeeping practices comply with all the regulations. Above all, you'll need to be prepared to be patient, as beekeeping is a painstaking, long-term process. Be prepared to spend around £800 initially on equipment, a beekeeping course, and the bees themselves. Finally, make sure you aren't allergic to bee stings, as you will definitely get stung at some point; have no fear, though: it will usually be by accident, as bees are not aggressive unless they feel threatened. If the effort involved doesn't put you off, beekeeping can be highly rewarding and fun, to say nothing of the tasty, homemade honey you'll get to enjoy. You can start by reading a book about beekeeping to see if you want to pursue it further.